KNOXVILLE - A former Georgia militia member testified Friday at his trial in a bizarre attempted courthouse takeover case, fighting back tears and saying "my government has called me a potential domestic terrorist." Prosecutors contend Darren Wesley Huff, of Dallas, Ga., drove to East Tennessee with a handgun and an AK-47 on April 20, 2010, after threatening to use force and to sacrifice his life if necessary to take over the city of Madisonville and the Monroe County Courthouse. Huff is charged with carrying a firearm in interstate commerce with the intent to use it in a civil disorder. He is also charged with using a firearm in relation to another felony, which on conviction carries a mandatory two-year minimum prison sentence. After getting the case late Friday, jurors decided to begin deliberating Monday. "This is the most humiliating thing I have ever been through," Huff said as Assistant U.S. Attorney Jeff Theodore cross-examined him on the fourth day of the trial. Huff said that as a member of the Oath Keepers organization he went to Tennessee in support of local activist Walter Fitzpatrick, who weeks earlier was arrested after trying to make a citizens' arrest of a grand jury foreman and other officials. Huff on that occasion carried a video camera to record Fitzpatrick's unsuccessful arrest attempt. Huff, whose attorney has described him to jurors as a "loudmouth," said testimony by two employees of his local bank about him threatening to take over the rural courthouse between Knoxville and Chattanooga was untrue. "I have never made a statement about taking over the courthouse, the city, the state, nothing," Huff said. "I never said anything about taking anything over." Defense attorney Scott Green in his closing argument reminded jurors that Huff told his plans to travel armed to Tennessee to an FBI agent who showed up at his house the day before he went and that Huff was under surveillance when he crossed the state line. Green said Huff showed officers his permit to carry the weapons and had no violent intent. Green asked jurors that if law enforcement considered Huff a threat, why did they allow him to go to Tennessee. "Why in the world did they let him drive to Madisonville fully armed?" Green said. "We are not here today if he doesn't run his mouth," Green said. Theodore showed jurors a video of officers on April 20 pulling Huff over in his truck marked with a huge Oath Keepers rear window decal and giving him a warning for following too closely as he was pulling off Interstate 75 near Madisonville. "I've got my .45 because ain't no government official gonna go peacefully," Huff tells them in the video. The video shows Huff placing his Colt .45 in a tool box where the assault rifle was being kept. Huff said he never removed the weapons from the truck toolbox in Madisonville after he arrived to dozens of law officers waiting around the courthouse. District Attorney Steve Bebb testified Friday that he was in Madisonville coordinating about 100 law officers that day, including some on downtown rooftops, in response to the expected turnout of extremists. "It was the tensest day we ever had," Bebb testified. Bebb said there were a lot of people he didn't know carrying guns. "I saw one man loading a gun in the parking lot near the jail," he said. Green told jurors they should ask why there were no photographs of the tense situation. "I can't fathom how something this monumental -- and you are telling me they didn't have a single camera there," Green said. "I submit to you there was nothing to see." Bebb said the citizen's arrest warrant that Huff and others were there to support stemmed from the Monroe County grand jury's refusal to allow a Fitzpatrick, a military retiree and government critic, to pursue treason charges against local judges, other officials and President Barack Obama. Fitzpatrick, a Navy retiree who became hostile to the government two decades ago when he faced a court-martial, is in state custody. Questions about Obama's citizenship have been raised by so-called "birthers." They claimed there's no proof Obama was born in the United States, and he is therefore ineligible to be president. Hawaii officials have certified Obama was born in that state, and the U.S. Supreme Court has turned away a challenge to the president's citizenship. Huff, a Navy veteran and former owner of an outdoor lighting business, traveled to Tennessee with a document he claimed was a "citizen's arrest warrant" bearing the officials' names, saying they were domestic enemies and that they had been charged with treason. Huff said he and about 15 others traveled to Madisonville on April 20, 2010 in support of Fitzpatrick, who had a court hearing that day. "We were going up to protest anyway," Huff said. 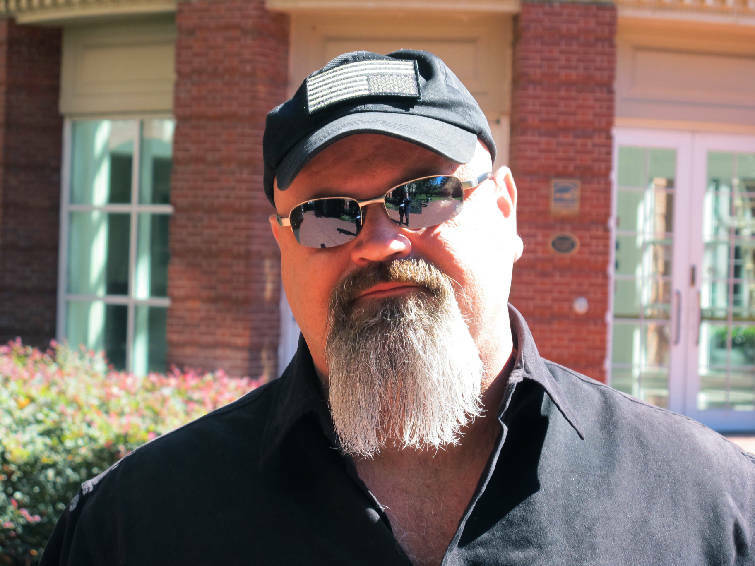 U.S. District Judge Thomas Varlan on Friday granted a defense motion to block prosecutors from making any comment about the Oath Keepers and militia groups kicking Huff out days after the trip to Tennessee.